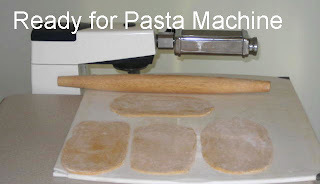 If you have never made fresh pasta, give it a try using this recipe, it is so easy. There is such a big difference in taste and especially texture between fresh egg pasta and store bought dry pasta. Now, that I found this recipe (on Internet, of course) I will make my own much more often but in smaller batches. processor is much simpler than the length of the instructions, which include directions for dealing with problems, would lead you to believe. This technique solves the basic problem in pasta making: getting a dough with just the right amount of moisture so that it's neither too soft and sticky nor too dry and hard to work. You start with the moist ingredients (egg and olive oil), then add just enough flour that the dough first gathers into a ball, then breaks up into granules, then gathers itself up again. When that happens, you know you've got just the right moisture content, and you can reward yourself by letting the processor do the kneading for you. The semolina or whole wheat flour that is added first can be used to give the pasta more body (semolina has more gluten than standard flour) or make it more wholesome. They're added first to give these hard-to-work ingredients more chance to dissolve in liquid. You can use as much of them as you like as long as the mixture is still a batter, to give the processor a chance to do its thing. The first time you make pasta this way, add flour in smaller increments. With experience you'll get a better feel for how fast to proceed, and after three or four batches you'll have a batch of noodles ready in under 10 minutes. Also with experience, you will determine the capacity of your processor; too large a batch will always gum up the works. Place the eggs, olive oil and salt in the bowl of the food processor and whirl briefly to blend. If using semolina flour or whole-wheat flour, add and process for 15 seconds. This mixture is supposed to make a thick batter, so feel free to add extra flour at this point. 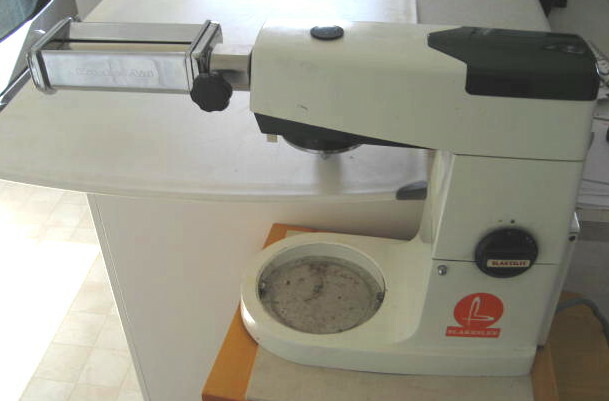 feed inch-size pieces of the dough back through the feed chute so that they break up on impact. If the dough is really sticky, add a couple tablespoons of flour first. If the dough has just the right amount of moisture, it will break up, whirl around for a few seconds, then start gathering itself back up into a ball, ultimately picking up all the stray pieces and rolling around the inside of the processor bowl, making a terrible racket and causing the processor to walk across the counter. When that happens, congratulations! Let it knead itself this way for 15 seconds, then stop the processor, remove the dough to a covered bowl and let it sit for 15 minutes. 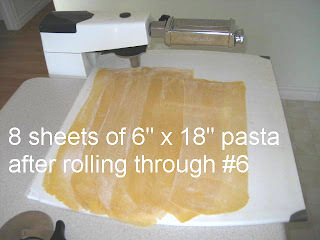 Proceed to roll it out with machine or rolling pin for the pasta dish of your choice. it gathers on the side of the bowl instead of in a ball, then stop the processor, grab some out, form it into a ball, return to the bowl and start the processor again. This will usually pick up the rest of the dough, and off you go. If not, add a tablespoon of flour, process it for a second, and repeat. My pasta machine is driven by commercial 8 quart mixer equiped with foot pedal for easy control. This dough needs another tablespoon of flour. 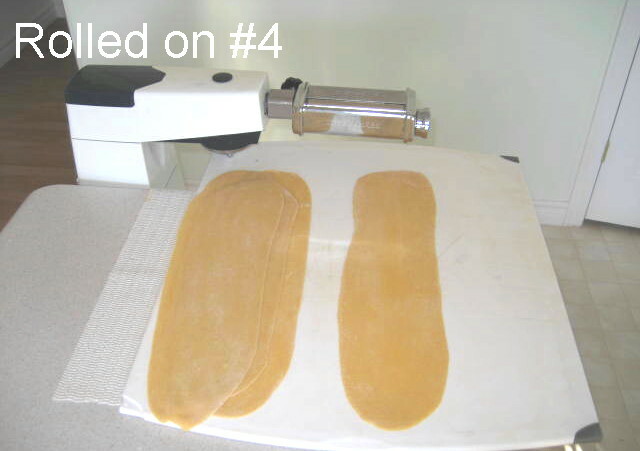 Dough has to be rolled by hand first to fit into rollers. Sheets of pasta are ready for final processing.